In the parlance of recession shapes, the Recession of 1973–75 in the United States could be considered a U-shaped recession, because of its prolonged period of weak growth and contraction. The 1973–75 recession or 1970s recession was a period of economic stagnation in much of the Western world during the 1970s, putting an end to the overall Post–World War II economic expansion. It differed from many previous recessions by being a stagflation, where high unemployment and high inflation existed simultaneously. Among the causes were the 1973 oil crisis and the fall of the Bretton Woods system after the Nixon Shock. The emergence of newly industrialized countries increased competition in the metal industry, triggering a steel crisis, where industrial core areas in North America and Europe were forced to re-structure. The 1973–74 stock market crash made the recession evident. The recession in the United States lasted from November 1973 (the Richard Nixon presidency) to March 1975 (the Gerald Ford presidency), and its effects on the US were felt through the Jimmy Carter presidency until the mid-term of Ronald Reagan's first term as president, characterized by low economic growth. Although the economy was expanding from 1975 to the first recession of the early 1980s, which began in January 1980, inflation remained extremely high until the early 1980s. The recession also lasted from 1973–75 in the United Kingdom. The GDP declined by 3.9% or 3.37% depending on the source. It took 14 quarters for the UK's GDP to recover to that at the start of recession. The oil crisis was largely to blame for the downturn in the United Kingdom, just as it was for the similar crisis in the States, although the real crisis[neutrality is disputed] came in the form of the Three-Day Week, which was the result of fears over power shortages as a miner's strike was announced in December 1973. The three-day week was a state of emergency imposed by Conservative prime minister Edward Heath, which came into force on 1 January 1974, meaning that commercial users of electricity were limited to three specific consecutive days' consumption of electricity, and forbidden to work longer hours of those days, although services deemed essential were exempted from these regulations. Electricity blackouts across the country were widespread. Edward Heath's offer of a 13% pay rise was rejected by the miners, and he then responded by calling a snap election on 28 February 1974 in what he saw as an opportunity for the electorate to show the miners that the government – and not the miners or the unions – were responsible for running the country. Most opinion polls suggested that the Tories would be re-elected with a majority, but when the election results came through on the morning of 1 March 1974, no party had an overall majority. The gap between Ted Heath's Tory government and the Labour opposition led by Harold Wilson (who had been prime minister for nearly six years until his surprise defeat by Heath's Tories in the 1970 election) was so narrow that the Tories received the most votes but Labour won slightly more seats. Heath fought to keep the Tories in government by attempting to form a coalition with the Liberal Party and offering a cabinet post to Liberal leader Jeremy Thorpe, but this attempt to remain in power proved unsuccessful for Heath and he was forced to resign as prime minister on 4 March, paving the way for Harold Wilson's Labour to return to power as a minority government before winning a second election on 10 October by a majority of just three seats. Economic growth was re-established in 1975 as the recession's end was declared, but Britain's economy remained shaky. Inflation remained high, strikes continued to cripple manufacturing and public services, unemployment continued to rise above the 1,000,000 mark, and just after the resignation of Harold Wilson as prime minister in March 1976, his successor James Callaghan was forced to call on the International Monetary Fund for a multibillion-pound bail-out in an attempt to bolster Britain's flagging economy. The Labour government's tiny majority was wiped out by early 1977 as a result of by-election defeats, and Callaghan managed to form a coalition with the Liberals to hang onto power. The pact concluded in the summer of 1978, by which time economic growth had picked up (although unemployment now stood at a postwar high of 1,500,000), and opinion polls suggested that Labour could form a majority government if a general election was held. However, Callaghan ruled out an election in September 1978, and within weeks a series of strikes began which would spark the Winter of Discontent in which Britain came to a virtual standstill with numerous strikes in the public sector. [neutrality is disputed] In March 1979, a vote of no confidence issued by Tory opposition leader Margaret Thatcher sparked the collapse of the Labour government and in the election in May that year, the Tories returned to power. The two major factors of the 1973–75 recession[neutrality is disputed] – inflation and strikes – were neutralised[neutrality is disputed] during the first term of the Thatcher-led Tory government, with inflation falling to a 15-year low and strikes to a 30-year low by the time of their election win of 1983, but the monetarist policies designed to curb inflation saw unemployment rise from 1,500,000 to 3,200,000 during that time and it was not until the turn of the 21st century, by which time Labour had been re-elected as New Labour under Tony Blair that unemployment fell below the level that it had risen to as a result of Thatcher's economic policies. The oil crisis of 1973 also had similarly large negative effects on other countries that relied heavily on imported oil, such as France, Sweden, Japan, Finland, Belgium, Luxembourg, and Denmark. Some newly industrialized countries saw some diversionary benefits from the crisis, namely Spain, Korea, Taiwan, Singapore, Mexico, and Brazil, as their low-cost environments attracted new investments and gave their products a competitive edge over competitors in higher-cost, developed countries suffering from higher energy costs. These countries gained increased market share both in their domestic markets and abroad at accelerating rates during the 1970s. In the United States, the economic recovery from the 1973 to 1975 recession had many of the characteristics of a typical U-type recovery. 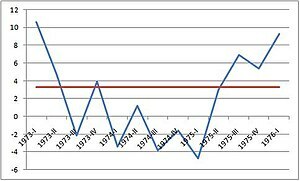 GNP (the measure at the time) reached and exceeded its pre-recession level by first quarter 1976. Industrial production had recovered to its pre-recession levels by the end of 1976. The major influence of the experience of the 1974 recession came in the form of the concept of stagflation, that is, inflation during a period of recession. The Federal Reserve adjusted its mandate as a result, believing that the inflation-unemployment tradeoff was much higher than previously thought, and established a 6% target as full employment. Thus, unemployment, which had reached a peak of 9% in May 1975, did not dip below 6% until June 1978. The pre-1974 recession level of 4.6% unemployment was not reached again until November 1997, when the Federal Reserve deviated from its prior policy. The interpretation regarding the cause of stagflation was and continues to be controversial. The oil embargo of 1973-74, which pushed prices of petroleum from $15 to $45 a barrel (2010 dollars) almost overnight, certainly contributed to inflationary measures during this period, taking a larger share of incomes (an "oil tax") at a time of falling consumer spending. The price of petroleum products continued to rise throughout the decade, reaching a peak of about $73 a barrel (2010 dollars) in 1979 as a result of the Iranian revolution, a price not exceeded until 2008 in the wake of dislocations due to the war in Iraq. ^ Martha C. White (12 January 2009). "This Recession Was Brought to You by the Letters U, V and L". The Big Money. ^ "NBER Business Cycle Expansions and Contractions". NBER. Archived from the original on 17 July 2007. Retrieved 1 October 2008. ^ "Unemployment continued to rise in 1982 as recession deepened" (PDF). Bureau of Labor Statistics. U.S. Bureau of Labor. Retrieved 15 October 2018. ^ "The Recession of 2007-2009" (PDF). Bureau of Labor Statistics. Retrieved 27 September 2012. ^ a b "Bank of England February 2009 Quarterly inflation report" (PDF). Archived from the original (PDF) on 15 November 2009. Retrieved 23 September 2009. ^ "1974 Feb: Hung parliament looms". BBC News. 5 April 2005. ^ "1974 Oct: Wilson makes it four". BBC News. 5 April 2005. ^ "1979: Thatcher wins Tory landslide". BBC News. 5 April 2005. ^ "1983: Thatcher triumphs again". BBC News. 5 April 2005. ^ Horváth, Dezsö (1982). Small Economies in the World Economy: The Case of Sweden. Institute for Research on Public Policy. p. 34. Retrieved 12 March 2019. ^ "Consumer Price Index: Sweden". St. Louis FRED. Federal Reserve Bank of St. Louis. Retrieved 12 March 2019. ^ Zarnowsky & Moore. "The Recession and Recovery of 1973-1976" (PDF). www.nber.org. ^ "Labor Force Statistics from the Current Population Survey". www.bls.gov. Bureau of Labor Statistics. ^ Baker, Dean. "The Federal Reserve Board Responds to Bankers". www.cepr.net. ^ Morris; et al. "After the Phillips Curve: Persistence of High Inflation and High Unemployment" (PDF). www.bostonfed.org. Federal Reserve Bank of Boston. ^ Okun, Arthur. "A Postmortem of the 1974 Recession" (PDF). www.brookings.edu. The Brookings Institution. ^ Williams, James. "Oil Price History and Analysis". www.wtrg.com/prices.htm.